Posted on August 7, 2010 under Travel. We woke up early in the morning as we needed to leave by at least 5:00 am or so to make it in time to Pangong. When we left, the skies were still overcast and it did seem that we might have grey skies that day. The road to Pangong took us through the scenic countryside and then up into the mountains. In a few hours we had reached Chang La Pass, which at 17586 feet above sea level, is the second highest motor-able pass in the world. Stopping there, we had some Ayurvedic Tea courtesy of the Army outpost there. The road after Chang La passed along streams, meadows and small villages. We passed encampments of Yak herders, sheep, wild asses and many more animals along the way. Somewhere along this scenic road our driver suddenly stopped and got out of the car asking for a biscuit. 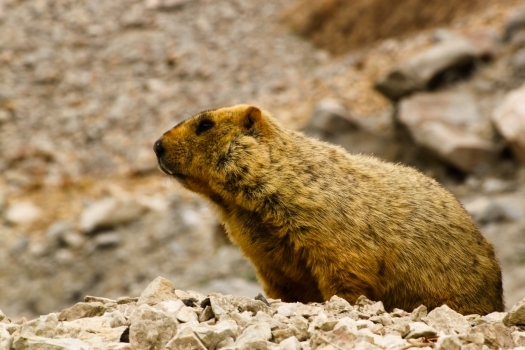 He had spotted a Himalayan Marmot on a rock and it tamely stood right next to him as I clicked its photograph. The cute furry creature didn’t seem all that enthused with the offering of the biscuit though. 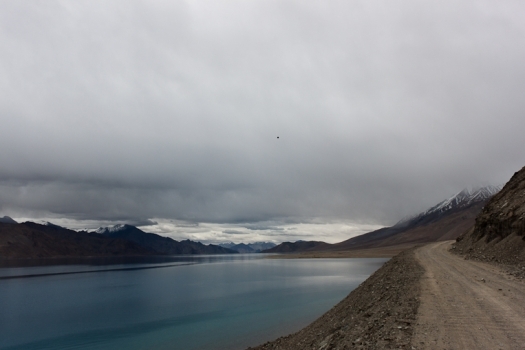 Soon, we caught the first glimpse of the famed Pangong Lake. It shimmered in its pristine blue splendor, giving two hoots about the grey skies. We rushed to click photographs of the colors, lest they vanish in the blinking of an eye. Our driver drove us along the lake up to a spot where they supposedly shot the climax of the movie “Three Idiots”. After a quick photo shoot at the lake we made our way to another part of the lake. There thanks to Gargi’s 300mm lens, I could get some great closeups of migratory sea gulls. Pangong, being one of the highest brackish water lakes in the world, plays host to these feathered creatures during summer. By now the weather seemed to be taking a turn for the worse with a very light drizzle starting at the lake. So we decided to head back as they was no chance of the weather changing and treating us to Pangong in its full splendor. However, the weather did make it up to us as well as we got some light snowfall at Chang La, something I’d always wanted to see.